This resilient and highly UV stabilized netting protects your crops or garden from hail damage, leading to higher yields and healthier plants. Also helps to protect crops from birds while still allowing plenty of sunlight through. The Anti-Hail Netting is the width chosen x the length you specify. Lead times for custom shade cloth will vary depending on the season, with very long lead times during the peak summer months. I live in Colorado and we had tennis ball to base ball size hail recently. There were only a couple of spots where the hail punched through and also a few spots where the hail stretched the netting. All of my vegetables were saved, tomatoes, squash, etc. I have used this netting for many years and currently have it covering 2 pergolas and a clothes line. This product has survived 100 mph winds over a pergola. I would give this produce 10+ stars if I could. This is the most WONDERFUL netting!!!!!!! I live in Colorado and summer thunderstorms are well-known along the front range of the Rockies. Too many times, I have come home from work, knowing that a hail storm hit my garden during the day, and I have cried tears of great sadness as I found my beautiful vegetable plants surrounded by piles of their own leaves :( !!!!!!!! So, I was excited to find this anti-hail netting and ordered it in February 2017. I set up my garden canopy and this netting has provided a nice light shade and protection for my garden for over a year, and has now been put to the ultimate test!!!!!!!!!! Two weeks ago (in the wee hours of the morning on June 13, 2018) an unexpected night thunderstorm produced 3-inch hail, the largest in 20 years!!!!!! My car suffered greatly and my poor greenhouse roof was destroyed, but this anti-hail netting SAVED my beloved vegetable garden!!!!!!!!!!!!! My plants were spared the brutality of the storm and suffered NO damage :) :) :) :) :) :) :) :) !!!!!!!!! The wondrous netting showed only a couple of very tiny places of wear from the storm!!!!!!!!!! AMAZING PRODUCT!!!!!!!! The best money I have ever spent!!!!!!!!!!!!!!! I highly recommend this netting to all gardeners where hail is an issue!!!!!!!!!!!!! I have used my anti-hail netting for over 4 years. It remains over my raised beds throughout the Colorado hail season, which is just about all summer. I has lasted without a single hole or snag and appears to be in nearly new condition, other than being dirty, and this is despite our intense Colorado sun. It is draped over the PVC arches built over my raised beds and is clipped to the PVC arches and to the edges of the beds with many nylon spring clamps. WInd, rain, hail, and sun have not damaged the material. Note that the customer who had trouble with it tearing used grommets which can tear out. In another area of the garden, one where there are no raised beds or arches, I built tall supports out of PVC and thus keep a netting awning of sorts going from the fence edge to the supports on the other three sides creating a cover the whole tomato bed. Here, too, it is clipped to the PVC and fends off the hail without blocking too much of the sun. I think that he shade factor (13-15%) is a worthwhile trade off for 100% hail protection 24 x 7. If you live anywhere that has bad hail storms (I'm in Colorado) do NOT waste your money on this. I had a storm yesterday and 30 feet ripped off one entire side of my garden leaving the grommets on the fence, pulled the vertical post to the side holding the door that no longer closes, and has crushed the tomatoes in the Wall o Waters under it. Called customer service and they will NOT warranty this product. Won't ever buy anything at this company again. This stuff is awesome to work with. A couple things I learned along the way. 1) If you going to use it on a chainlink fence toprail hoop house, go to Johnny's Seeds and buy the plastic snap clams that comes in bags of 10 and each is 4 long. They are easy to install but they're very tight. It take a fair bit of strength to snap them in place. Once there, they are not going any where. 2) greenhouse mega store was far and away the most affordable price at $3.30 a linear foot. A local greenhouse wants $10 a linear foot and I suspect they're still making money off it. 3) greenhouse megastore told me to expect a month to get the product but I got mine in less than a week. It may depend on the time of year, but I can definitely say mid March is definitely a great time to order. It looks awesome .... almost like I knew what I was doing and like it wasn't my first hoop house :-) It turned out very professional looking. I have had two hail storms since i put it over my hoop frames. It worked great no damage to plants. I ordered more for my other gardens. thank you. I received the netting 3 weeks earlier than expected. It is a tough material and has worked perfectly at hail protection. 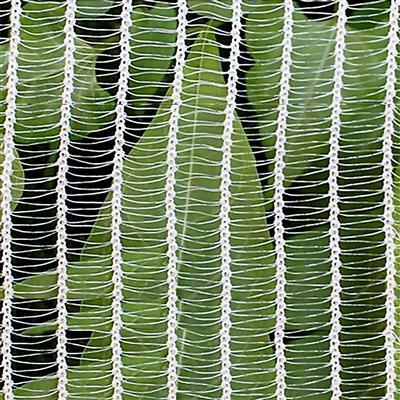 This netting can be used multiple seasons due to the high quality material and strength of material as well. Netting is tough and very easy to work with. We've had on small hailstorm and it held up fine. Have not had any large hail yet though. But, the product seems sturdy and doesn't rip or tear. Delivery of product was earlier than promised. Highly recommended. I wanted to wait for hail to write but we haven't had any since I put up the hail cloth! Go figure! But we did have three late spring snow storms that ruined both the rebar and the PVC pipe of the hoop houses. However the hail cloth is still in fine shape. It was a most reasonable price and far exceeded my expectations. I wish I had bought more at the time because I don't need enough to warrant buying $60 worth. I would have put it everywhere including over our fruit trees. This is a great product. Very durable. Easy to cut to the sizes that I needed. It arrived in a timely fashion. I have used it on my garden and am relieved I don't have to worry about hail destroying my garden. It was easy to place and is very durable. I put stakes in the ground (higher ones in the middle so the hail would run off) and draped this cloth over them. I did nail the tops of the stakes to hold the cloth on some places, but not on others and they seem to be holding up just fine. I can water and fertilize through it. Occasionally I raise the sides to remove weeds and pick the produce. It is not a hassle at all especially considering the benefits! Shipped in less than 2 weeks. Stuff looks burly. We'll see how it performs this year in the Front Range. We've had some monster hail storms last few years. I did not want to post any review until the gardening season is over. I am so impressed with this product and have recommended to all of my gardening friends. Not only did it save my garden from several replants from hail storms in Denver, but all of my plants did better than my neighbors and I think that the UV protection made a big difference. Even with several major cuttings, my tomatoes grew over 7 feet tall and had seemingly unlimited fruit. This material works really well. Just a couple of days after putting it up we had a hail storm. This held the potentially damaging stones and let the water through. Plus, it also gives a little bit of needed shade to the very sunny area we have it on. Highly recommended! Have the hail netting installed over my garden so if we get the horrible hail storm like the last two years I'm ready. Looks great. I wanted to wait until a hail storm hit before writing a review. Well, we had 15 minutes of large pea sized hail coming down pretty good and it all bounced right off our hail netting saving our garden. I would definitely recommend this product. I have lost vegetables to Front Range hail damage for years. I decided to try the hail cloth and it is absolutely amazing. Yesterday we had a huge hail storm and I watched the hail bounce off and my tomato plants were unharmed. This is a great product. I'm giving this a 4 rating because it hasn't been tested by a hailstorm yet. I ordered too late to protect my garden against early summer hailstorms this year, but I think it's going to provide good protection for the rest of this season and ready to go for next growing season. I was pleased with the faster than expected delivery of the anti-hail netting and with the amount of light it admits to my vegetable garden. I needed the product to keep the surrounding trees leaf fall off my orchids and still let a lot of light through. It is working perfectly so far. After one week of having the hail net up, raccoons decided to climb on it. The material is now all stretched out with holes in. I'm afraid I wasted my money. I have wanted anti-hail netting for years and finally found it. I keep it over my raised beds at all times since Colorado hail storms are highly localized and unpredictable and can be quite destructive. My beds have sturdy pvc arches over them so I drape the netting over them and just clip the netting in four corners to prevent blowing. Perfect because it does not get saturated and sag, does not shade the plants, and is easy to remove for tending the vegetables. After a hail storm that flattened EVERYTHING except the ONE flower bed we had covered with this hail cloth we said NEVER again ! We ordered 5,000 sq. Ft more to cover the rest. The earlier hail broke windows, dented cars, ruined roofs but this hail cloth didn't even show a mark. It is tough, tough, tough. You can cut it with regular scissors but I would suggest a commercial pair. Because of the lag in delivery for white we took the RED. It is stunning and looks like Christo art work. We love it!Oh, did I say how TOUGH it is? You can't rip it with your hands. Purchased to protect garden from hail. Works great and would definitely purchase again. This hail cloth is exactly what I was looking for, and I'm surprised that it is so hard to find.